Well, that's the best I can do. Please forgive me this week - my brain is drained, and all the fluid swishing around up there (along with that little monster using his hammer to beat on my face, temples, and brain) is preventing me from coming up with some great post. I promise to be better next week! what a great take on this week's theme--love the photos you chose!! Love the way you made the words from stack. Bloggers certainly use STACKS of words...great interpretation! Forgive for what? Those are excellent photos - and the text too for the word stack. I didn't know they used to jump like that, quite impressive! Stop that apologizing!...you are so creative! My fav was the jumping photo...cute! I liked the word thing a lot. Great take on this week's theme. 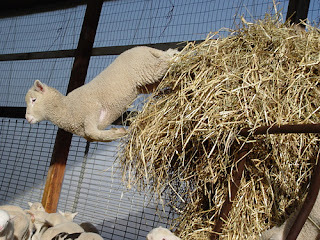 Love the lamb pics. You did a fine job on the meme. An interesting take on it. I'd never know you were suffering from "brain drain." This was a very creative response! Oh... I´d love to play with the cute sheep. Just play. Honestly. great idea! thanks for stopping by mine! happy hort! I haven't done the word thing in years, I must do it now... thanks. Loved the photos. I remember playing Boggle and forming all sorts of words. Nice job on the word stack. Cool photos! Those lambs are so cute! awwww do you have sheep? mine is up... a day late, but it's up. I love anagrams, thank you! 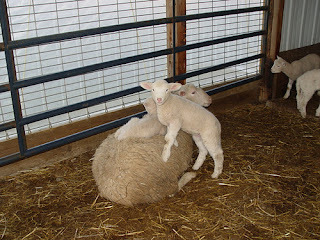 And even better, you gave us bonus photos of things I've never seen: baby sheep on mom and leaping sheep. Those are great photos! !